Specifically designed to work seamlessly with the Octagon Advance series digital incubators, this humidity pump includes a peristaltic pump and an external water reservoir which eliminates the chances of water in the incubator harboring bacteria. The unit stands beside the incubator and is connected to it by an electrical lead and a flexible tube for water supply. Humidity settings are controlled directly from the incubator's intuitive digital menu and the achieved relative Humidity (RH) is continuously shown on the incubator’s digital display. 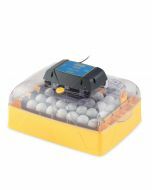 The Humidity Pump effectively maintains the humidity level precisely at the level the user sets irrespective of changes in room humidity and so overcomes problems that can commonly lead to eggs failing to hatch – especially in the latest stages of incubation. 11" x 5" x 15"
Does the HUMIDITY PUMP FOR BRINSEA OCTAGON SERIES EGG INCUBATORS work with any incubator? No, this will only work with the Brinsea model incubators.